Can't rate the quality as we haven't used it yet but gotta love a cheaper alternative with the same ingredients. Arrived quickly as usual. Can't fault the service. Manufactured primarily for the catering business, our Gompels Sterilising Fluid offers a chlorine based clean. The bleaching agent has been specially formulated to kill bacteria, viruses and fungi within a 15 minute time frame making it ideal for nurseries, hospitals and care homes. Designed to mimic the same active ingredients as brand leader, Milton, it can effectively be used to sterilise everything from bottles, teats and utensils through to floors, worktops and plastic protective clothing. Suitable for use in food preparation areas, the sterilising fluid doubles up as a water sanitiser while being adequate for washing fruit, vegetables, meat and chopping boards. The formula is non hazardous and gentle on skin therefore requiring no additional protecting clothing. 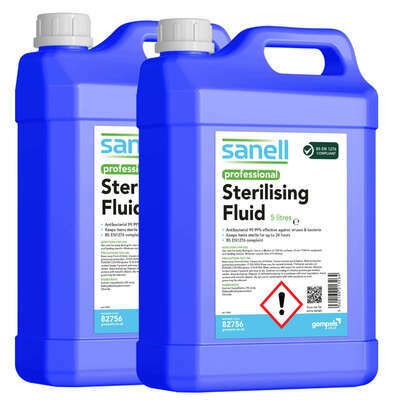 Our sterilising fluid is also available in a multi pack of 12 1litre bottles for replenishment or smaller businesses that favour this convenience. For clear identification, consider decanting your liquid into smaller bottles and labelling with our clear Labels - available online for an exceptional wholesale price.